← Politically Correct? You’re Damned Straight I Am! nb. This data will be made public, including Social Security numbers, if state databases contain it. Privacy? Who cares in the face of .000004% voter fraud? Identity theft? Not Kris Kobach’s problem. Where is the leadership in this administration? A commission created by President Donald Trump to enhance confidence in America’s elections has asked all 50 states for copies of their voter records which often include names, addresses and ages. The commission has said it intends to make the information widely available. ProPublica, June 29, 2017, 6 p.m.
On Wednesday, all 50 states were sent letters from Kris Kobach — vice chair for the Presidential Advisory Commission on Election Integrity — requesting information on voter fraud, election security and copies of every state’s voter roll data. The letter asked state officials to deliver the data within two weeks, and says that all information turned over to the commission will be made public. The letter does not explain what the commission plans to do with voter roll data, which often includes the names, ages and addresses of registered voters. 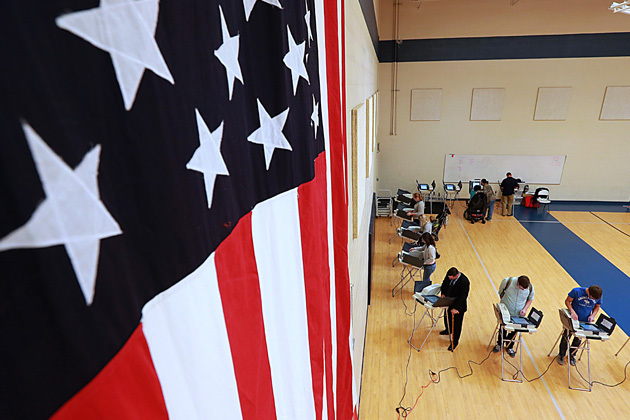 The commission also asked for information beyond what is typically contained in voter registration records, including Social Security numbers and military status, if the state election databases contain it. President Donald Trump established the commission through an executive order on March 11. Its stated goal is to “promote fair and honest Federal elections” and it is chaired by Vice President Mike Pence. The commission plans to present a report to Trump that identifies vulnerabilities in the voting system that could lead to fraud and makes recommendations for enhancing voters’ confidence in election integrity. No deadline has been set for completion of the work. David Becker, the executive director of the Center for Election Innovation & Research, also expressed serious concerns about the request. “It’s probably a good idea not to make publicly available the name, address and military status of the people who are serving our armed forces to anyone who requests it,” he said. Kobach, the secretary of state in Kansas, has been concerned about voter fraud for years. His signature piece of legislation was a law requiring Kansans to show proof of citizenship when they register to vote, which is currently ensnarled in a fraught court battle with the American Civil Liberties Union. He has written that he believes people vote twice with “alarming regularity,” and also that non-citizens frequently vote. Multiple studies have shown neither happens with any consistency. Kobach also runs the Interstate Voter Registration Crosscheck Program, a proprietary piece of software started by Kansas Secretary of State Ron Thornburgh in 2005. Under the program, 30 states pool their voter information and attempt to identify people who are registered in more than one state. Some expect the information Kobach has requested will be used to create a national system that would include data from all 50 states. It is not uncommon for voters to be registered in more than one state. Many members of Trump’s inner circle — including his son-in-law Jared Kushner and daughter Tiffany Trump — were registered to vote in two states. Given the frequency with which voters move across state lines and re-register, the act of holding two registrations is not in itself fraud. There is no evidence to suggest that voting twice is a widespread problem, though experts say removing duplicate registrations are a good practice if done carefully. “In theory, I don’t think we have a problem with that as an idea, but the devil is always in the details,” said Dale Ho, the director of the ACLU’s Voting Rights Project. While he believes voter registration list maintenance is important, he says Kobach’s Crosscheck program has been repeatedly shown to be ineffective and to produce false matches. A study by a group of political scientists at Stanford published earlier this year found that Crosscheck highlighted 200 false matches for every one true double vote. “I have every reason to think that given the shoddy work that Mr. Kobach has done in this area in the past that this is going to be yet another boondoggle and a propaganda tool that tries to inflate the problem of double registration beyond what it actually is,” Ho said. Some experts already see sloppy work in this request. On at least one occasion, the commission directed the letter to the incorrect entity. In North Carolina, it addressed and sent the letter to Secretary of State Elaine Marshall, who has no authority over elections or the voter rolls. In that state, the North Carolina Board of Elections manages both. “This lack of openness is all the more concerning, considering that the Vice Chair of the Commission, Kris Kobach, has a lengthy record of illegally disenfranchising eligible voters in Kansas,” she wrote. Alabama’s Republican Secretary of State John Merrill (no relation) also indicated he had questions for Kobach regarding how much of the data would be made public and how Alabamans’ privacy would be protected, even while he expressed support for the commission. “Kobach is a close friend, and I have full confidence in him and his ability, but before we turn over data of this magnitude to anybody we’re going to make sure our questions are answered,” he said. The extent to which voter roll data is public varies across the country. While some states, like North Carolina, make their voter rolls available for free download, other states charge high fees. Alabama, for example, charges one cent per voter in the roll for a total cost of more than $30,000. The state law provides a waiver for government entities, so Merrill said the commission would receive the data for free. Other states, like Virginia, do not make this information public beyond sharing it with formal campaigns and political candidates. When ProPublica tried to purchase Illinois’ voter roll, our request was denied because they only release it to government entities for privacy reasons. Illinois did not respond to a request regarding whether they would release this information to the PCEI, which — while a government entity — intends to make the information public. The letter from the commission also asks quite broad questions of state elections officials. While the commission is being chaired by Vice President Mike Pence, Kobach signed the letter alone. Jon Greenbaum, chief counsel for the Lawyers’ Committee for Civil Rights Under Law, said this is an indication that Kobach — not Pence — “will be running the show,” which he said should be a point of concern. “As we know with Kobach, he’s obsessed with trying to identify voter fraud and finds it in a lot of places where it doesn’t exist,” he said. Vanita Gupta, the former acting head of the Department of Justice’s civil rights division under President Barack Obama, said the commission’s letter was an indication the commission was “laying the groundwork” to carry out changes to the National Voter Registration Act that might seek to restrict access to the polls. The National Voter Registration Act — sometimes called the Motor Voter Act — was enacted in 1993. It allows the DOJ the authority to ensure states to keep voter registration lists, or voter rolls, accurate and up-to-date. It also requires states to offer opportunities for voter registration at all offices that provide public assistance (like the DMV). In November, Kobach was photographed holding a paper addressing national security issues and proposing changes to the voter registration law. It is not clear what these changes were. The ACLU is involved in a lawsuit against Kansas’ state law requiring people to show proof of citizenship in order to register to vote. As part of the suit, ACLU lawyers requested access to the document reflecting the changes Kobach proposed. Originally Kobach told the court the document was beyond the scope of the lawsuit, but last week the court found the documents were relevant and that Kobach had intentionally misled the court. He was fined $1,000 for the offense and required him to turn the document over. It has not yet been made public. Gupta said her concern about the future of the voter registration act was deepened by the fact that, on Thursday, the DOJ sent a letter to the 44 states covered by the act requesting information on the maintenance of their voter rolls. States were given 30 days to answer a set of detailed questions about their policies for list maintenance. “The timing of the letters being issued on the same day is curious at the very least,” she said. The White House and the DOJ all did not respond to requests for comment about the letters. The letter did not ask about compliance with the portions of the act that require states to attempt to expand the voter base, such as by offering voter registration forms and information in public offices. Danielle Lang, deputy director of voting rights for The Campaign Legal Center, said the focus on list maintenance troubled her. While she said this might point to a new direction in enforcement for the DOJ’s voting rights section, it was too early to tell how this information might be used. Levitt said he did not recall a time when the DOJ has previously requested such broad information. While the information is public and not, on its face, troubling, Levitt said the only time he recalled requesting similar information was during targeted investigations when federal officials suspected a state was not complying with the law. This entry was posted in Civil Rights, Privacy, Trump, Voter Fraud and tagged election fraud, elections, Kobach, Kris, voter. Bookmark the permalink.